Ever since seeing Zana’s cutout skull sweater by Pleasure Principle, I’ve had a major crush on the label. From their fantastically simple split knee jeans to their knot dress, their designs are extremely covetable. Anyway, to the point of this article (which wasn’t to gush about the brand), I’d been lusting over Pleasure Principle’s cut out spine tee for what seems like ages when I realized that it would make a rather simple DIY project. 1. Draw out your design on your garment. It’s best to do this in something that can be washed out (water-soluble marker) or rubbed off (tailor’s chalk) in case you change your mind about something as you start cutting. Also, I suggest keeping the cut edges at least a ¼” apart from each other to reduce the possibility of anything unraveling/tearing/etc. 2. Cut the fabric along the places you’ve marked. 3. Apply Fray Check to the raw edges and let dry. 4. Wear your new creation and post it on Chictopia! The best part about this DIY is that there are endless possibilities! You could cut virtually anything anywhere on the garment of your choice. I’m excited to see what your creative minds will come up with! thank you so much for posting this! It's absolutely stunning! Love it make me one fellow long lost sister of style ! aw thanks for your tips ! =) where can i get liquid seam sealant? can you message me please? 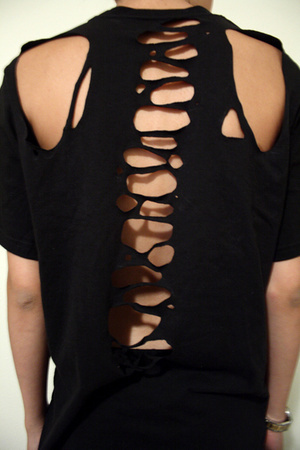 wow, I really love tips on how to turn the 'boring' t-shirt into something fun:) MORE!! If you use glue, I don't think you can wash it. I'm going to buy a tee right noooooow!!! This looks really cool, but I have no idea where to buy seam sealant. i think you can find it at most craft/fabric/sewing stores. love it. its so creative! oohh sooo cool. I'l have to try this one! amazing! i think that your version is more aesthetically pleasing, actually. That turned out so well. Funny I use Fray Check on my pointe shoe ribbons but never thought of using it to keep a cutout from fraying. i think if you actually looked at spinal anatomy it would look a bit more like the original, rather than a series of pebbles. i, however, think the idea is funking awesome, and studying spines and all that i think ill be doing similar. awesome! i mgith just start diy-ing my old clothes. this is soo awesome i cant wait to try this! wow, i'm tempted to try this myself. awesome tip! i'll probably end up hand washing my shirt, just in case. i may make a test shirt, run it through the wash and report back here to let you guys know how it does. very cool. i love diys. well the idea of them. the actual doing part is what gets to me ha. love it, camille! effin YES!! im doing this!! This is amazing. I really really love it! OMG this is fabulous. I'm a total biology geek so this would be perfect to add to my collection!! That turned out so well!